"The best program to learn Japanese online. Period." Just recently I signed up for a free trial of Rocket Japanese. The free trial offers full access to the full online course for a six-day period. There are various Japanese language courses on the market, but none with the diversity of learning tools found in Rocket Japanese. Through inventive learning lessons, this Japanese course by Rocket Languages incorporates fun exercises, games, quizzes and progress tracking tools to maintain user engagement. Each lesson is different from the next, creating a diverse and exciting experience, far more conducive to success than the standard word repetition found in other programs. Whether you are learning Japanese for career purposes, personal reasons or travelling around the country, this course will have you speaking basic phrases within days. It comes with 31 audio lessons of approximately 20 minutes each. That's over 13 hours of learning. Each conversation is broken down into easily manageable parts and coupled with written transcripts of the conversations in Romaji the Japanese characters (Hiragana and Katakana) and English translation. 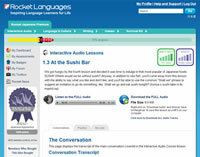 The audio lessons cover useful topics such as Greeting, Meeting, Food and Drink, Travel, Nightlife, Arts and Culture, Family and Friends, Business Japanese. Perhaps the hardest thing about learning Japanese is the pronunciation. To combat this Rocket Japanese uses a software called Rocket Record, which utilizes voice mapping technology that you can record and repeat your pronunciation until your voice map matches that of the native host. The MegaJapanese software-based word games will build your Japanese vocabulary, test your audio recognition of Japanese words, and take the mystery out of Japanese writing. Another valuable component is MegaVocab, a Word Building Game that increases the number of Japanese words in your armory. MegaVocab has over 1,000 words and 20 topics, and by using the MegaVocab Creator, you can add words and pictures to the database. For people interested in learning to write Japanese, the MegaHiragana software is specifically designed for fast-track learning. MegaHiragana introduces students to the hiragana character set in a way that makes recognition and memorization painless. In addition to more language learning features the course includes 31 Culture and Language lessons that provide insights into a wide variety of situations such as travel tips, transport, etiquette, Japanese food and drink, greetings, body language, sports, holidays, the workplace, and more. Your progress is tracked by tests, which are taken periodically at your leisure. As you progress, you will receive certificates as recognition of your progress and ongoing success. This assessment and reward is a key factor in maintaining motivation. As a lifetime member you'll receive instant access to the Japanese Learners Forum, where a team of native speaking Japanese teachers and fellow enthusiasts will answer your Japanese language questions. This is an essential part of home study where the absence of a classroom teacher can thwart progress. Rocket Languages offers a 60-day money back guarantee. Thus you can begin learning Japanese for the first two months, and if you don't find that the program is for you, you can return it for a refund - a great incentive to get started right away. Comprehensive and fun Japanese language learning software. Great emphasis on both language and cultural learning. Periodic testing, progress tracking, and certification provides encouragement and motivation. Multi platform compatible for learning on the go - lessons easily transferable to iPod and MP3 devices. Lifetime access to Japanese Learners' Forum for support and assistance. Now very affordable at $99.95 instead of the RRP $299.95. Lack of initial skills assessment. More aimed towards beginner to upper intermediate learners. Rocket Japanese is a multi dimensional program for people aspiring to fast-track learning. After just a few days of using the program you will begin to gain basic understanding of simple phrasing. Because Japanese has a reputation for being hard to learn, it is important that learning is made engaging and fun, and this is certainly the case with this course. The variety alone will increase your ability to retain more language and stay focused on learning. Anyone learning an eastern language must also gain a proficient level of cultural knowledge. Rocket Languages recognizes the importance of this and delivers an excellent cultural program alongside its language learning audio, exercises, games, and quizzes. The program is wholly comprehensive and very affordable, making it stand out considerably amongst its rivals.